Family friendly hotels in San Francisco which can accommodate 5, 6 or 7 in one room are listed in alphabetical order below. The interactive Google map shows the hotel rooms and family suites San Francisco location. The price or rate range of each hotel, for budgets from affordable to luxury, is indicated. See the $-symbol key in the sidebar. The list includes large hotel rooms, suites, hostel, motels, and inns. Click on the hotel name for more details about the family accommodation. San Francisco places to stay are modern, and these all have private bathrooms unless otherwise mentioned. 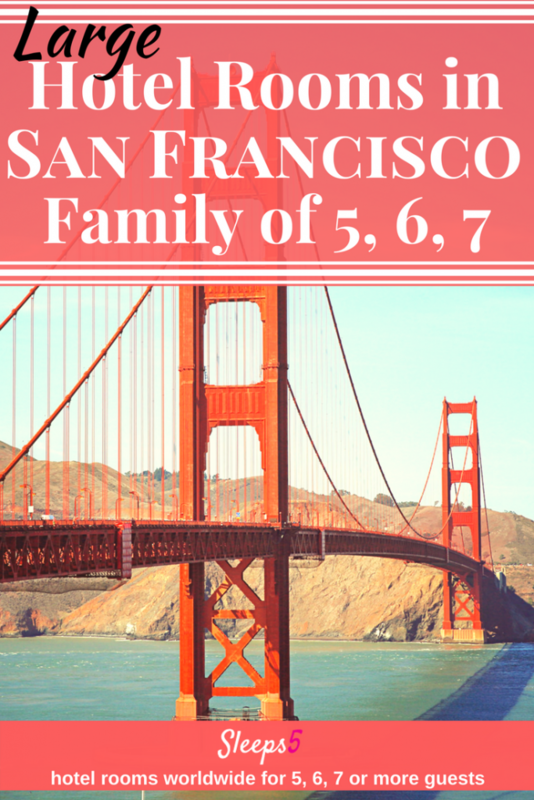 We hope to help you find where to stay in San Francisco with family! Pin this San Francisco family hotel list now! See the Sleeps5 home page menu to find more United States large family hotel rooms listed. Included are Anaheim (Disneyland) large hotel family rooms, and a wide variety of Seattle hotel family rooms, plus a blog post and a few family-friendly hotels for Palm Springs. Things to Do in San Francisco and Silicon Valley, Bay Area places for kids and adults who like computers, science, and technology. For charging multiple devices, keeping travel organized, and your hotel room quiet, see this list of handy gadgets for family travel and a Sleeps5 review of the Waka Waka solar charger. San Francisco Travel tourism website.